Welcome to your Reiki Blog! Today I am going to share a predictable trend I see in South Mumbai. When I do Reiki Courses in South Mumbai I find that one of the things my students really look forward to besides self growth is relief from stress. We live a fast paced life. We do multitasking. We work on several projects at once. We never really have enough time. This leads to stress and the beauty of Reiki is it dissolves stress so easily in moments. The purpose of Reiki is spiritual growth and there are worldly benefits like stress relief when we practice Reiki. So we get best from both the worlds with this gentle therapy that brings balance in our work, life, body, mind, emotions and spirit. If I had known that Reiki would transform my life to such an extent, I would have learn Reiki much earlier! If you have been thinking of activating your own innate ability to heal yourself and others and bring abundance of peace and happiness all around you then its time you learn this effective and safe spiritual practice of Reiki. 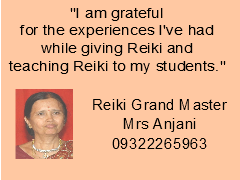 Most of my Reiki courses in South Mumbai are for individuals and families that prefer to have a special session. To schedule your Level 1, 2 or 3 class call me on 09322265963. 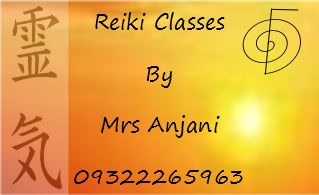 This entry was posted in Reiki, Reiki Courses, Reiki Courses in South Mumbai and tagged Mrs Anjani, Reiki courses, South Mumbai by Admin. Bookmark the permalink.